While vacationing with a friend in Paris, an American girl (Maggie Grace) is kidnapped by a gang of human traffickers intent on selling her into forced prostitution. Working against the clock, her ex-spy father (Liam Neeson) must pull out all the stops to save her. But with his best years possibly behind him, the job may be more than he can handle. Famke Janssen also stars in this relentless action-thriller from director Pierre Morel. Download Taken in Digital HD from the iTunes store. Taken images are © 20th Century Fox. All Rights Reserved. 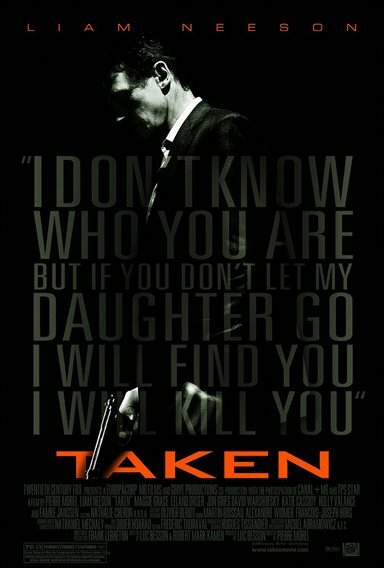 The trailer for Taken has Liam Neeson on the phone with his daughter who is in a hotel. She has just witnessed some thugs grab her friend, and as her father tells her to hide under the bed, we get the impression he is pretty cool-headed for someone who is going to lose his little girl to kidnappers. When she hides under the bed, he tells her that the next step is that ... she is going to be taken. After they grab her as she is screaming, we hear his voice on the phone with the kidnappers; he tells them he has a lifetime of skills in the art of finding people like them, and he is going to. And when he does, he is to kill them. This sums up the plot of the movie. 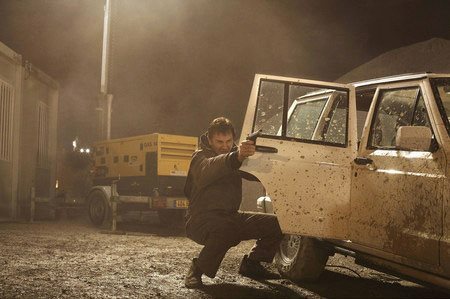 Liam Neeson, ex-CIA spook, hunts for his daughter in a relentless chase-movie. He follows the trail of clues, while relentlessly killing the bad guys he encounters. It is a French movie, produced by Luc Besson, who apparently churns out French thrillers like a cookie-factory makes cookies – they are quickly rolled out ... and they are all kind of the same. It is true that there is a sense of the "mass produced" in Taken. It has pre-requisite car chases, spy plot-points, and exotic locations, e.g. Paris – that is still exotic, isn't it? It makes it's points carefully -- almost "by the numbers". We learn that Neeson's character is a control freak and he has attention to detail when we see him wrapping a present -- carefully touching each of the edges of the paper to get them straight. Then, of course, the movie reinforces that by having a character tell us that he is Mr. Attention-To-Detail. This kind of film making isn't so much uninspired as it is lowest common denominator. Taken also isn't one of these movies that benefits from a lot of inside knowledge of its subject. It is technically competent, but rather than giving us gritty realism, it appears to me that it goes for an over-the-top sensibility that seems a little behind the Bourne movies in believability. There are enough lucky breaks and questionable coincidences where you can see every now and then the narrative being dragged along and then stitched back together by the writers. This isn't a movie that will teach you anything about international crime and corruption or human trafficking and/or spy craft. It is more heavily influenced by a movie-version of what all those things are like. That said, given the premise that a young girl has a killing-machine for a father; and when she is kidnapped, he slaughters his way across Paris to get her back, it doesn't disappoint. Neeson has enough star-power to carry the piece. The bit characters are okay if not startling. The movie doesn't give us too much of a lecture on the previous administration, and the fight scenes are reasonable, and if not short, at least give a decently violent rush. Where Taken falls short is that it doesn't really show us anything we haven't already seen before, even around the edges. I am glad it didn't make someone that was very unlikely to be behind the kidnapping (although all of these movies need some element of betrayal to have that movie-spy edge of there being no trust in the world of espionage). The beginning has some divorced-dad stuff that left me a little cool, but it does perform the bare-minimum necessary to set up the character and the conflict (a little more on that below). And the bad guys? All pure stereotypes. I think what is left to talk about is the "message" of Taken. This is in quotes because I suspect that the film makers aggressively strive not to have a message in their movie -- other than maybe "human trafficking and corruption are bad". The story unfolds as it does because young women (and this is reinforced no less than three times in the film) are unsuited to being out on their own -- they are victims. Neeson's character knows this -- his daughter's mother, from whom he is divorced, does not. When the daughter leaves the protected enclave of her home (bristling with, yes, male security), she immediately becomes a target and engages in foolish behavior. As I said, this pattern is repeated both in the opening where Neeson does a security gig for a young, female, singer, and later on in the show where we see another young traveler about to make some predictable mistakes. It is true that people do get scammed, and that travelers in another country are especially vulnerable. However, there is no precedent for the wholesale kidnapping of young wealthy travelers in Western Europe; that is entirely made up, and, in fact, would not stand for an instant. If you want to read about some real scams that are perpetrated on travelers in Europe, try this link. On the other hand, for Taken, I think I have to conclude that rather than having a basis for its set up, it instead, is pandering to our darkest fantasies of what "other countries" are like -- and taking for granted a rather dim view of gender (e.g. at face value, Taken tacitly assumes that all young women need powerful bodyguards and need to be more or less kept at home). While I am sure it does not hurt the movie with its target demographic, even a cursory analysis of it left a bit of a sour taste in my mouth. Taken images © 20th Century Fox. All Rights Reserved.